It is an unwritten fact that guitarist and pedals are meant to be. The love affair has been unbroken for decades and will seemingly never end. The ability to alter a guitar’s tone, as well as create your own chain of tones together, is something that every versatile guitarist strives for. Having a great pedalboard set-up can save many guitarist from the pedal dance – the constant turning off and on of pedals to change tones after or during songs. Being able to simplify and streamline your stompbox chain can save you from the hassle of coordinating all of those foot-switches and allows you to focus on performance. Navigating a labyrinth of pedals mid-song can be tricky. So here are a couple of ways to incorporate switchers to simplify your workflow. There’s nothing wrong with having an array of pedals. In fact, the more quality pedals you have, the more tones you can, essentially, create. However, many guitarists struggle with the process of putting them together in a chain, and the signal loss that can occur if certain pedals are not ‘true bypass’. Having these pedals, and a knowledge of setting these up correctly, is a great skill to have (you can read more about organising pedal chains here). For example, you can set-up the chain of delayed overdrive with a touch of phase, or delayed phase with a touch of overdrive. This is perfect if you require one guitar sound for an entire song, say when recording, but even so, this is rarely ever the case. 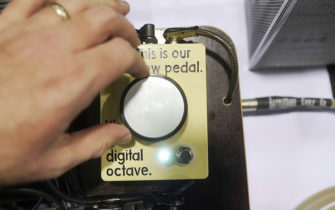 Enter the modern day switcher – a great way to enhance your pedalboard and save yourself from excessive foot stomping. It can seem a little daunting at first if you don’t understand exactly what is happening. With a little bit of practice and knowledge, however, these switchers can dramatically help your work flow and enhance your performances. Products like the Boss MS-3 or the Voodoo Lab Ground Control Pro switchers are a great addition to any pedalboard. Not only can you connect some of your favourite pedals into these systems, but they have their own preset effects that can get you by on most gigs, in you forget your pedals in a mad rush. Being able to blend these digital and ‘real’ sounds, and create a happy medium, takes experimenting and time. It does, however, give you the opportunity to create greater tones without the need for a plethora of pedals, with potentially very little space on stage. The Boss MS-3 has around 112 different effects already loaded on it, with room for 200 more patches to be loaded into it. The great thing about this is that you can also alter the signal chain and change these presets if you like. For example, if that preset flanger sound has too much reverb on it, you can go into the chain and turn it off. This product also features three loops for those favourite pedals of yours, for switching between your custom chains. The Voodoo Lab Ground Control Pro is a full-featured MIDI foot controller that offers flexibility and control, much like the Boss MS-3. It features 12 foot-switches for patches, as well as two bank switches and an edit foot-switch. It offers four pedal loops, as well as MIDI in and out. The presets may not be as comprehensive as the Boss MS-3, but this allows more inventiveness when it comes to creating your own tones. Let’s say we have three pedals: an Ibanez TS808 Tubescreamer, a Boss CE-2 Chorus, and the MXR M169 Delay. In both systems, we can plug them straight into the three loop jacks they feature, and away we go. As touched on earlier, the way in which we connect these pedals in the chains will effect the tone produced. If we think about that fact, if we use each pedal by itself or in a combination, we now have 15 different chains that we can create and then save into these systems. And switching between these different combinations is now all controlled by one simple tap of a foot-switch. Modern day switchers are easy to use, flexible, and will save you an ample amount of time in the long run. Having your favourite effects on your pedalboard is a must, but to have it be controlled and potentially enhanced by these MIDI multi-effects systems, is an integration that offers a great deal of imagination. So play around and experiment. Go to your local music store, research on forums, and ask questions. Find the sounds you want to create, and the easiest way in which to do so, and you are on your way to limiting the foot jig, and rocking out at all your gigs with no worries!